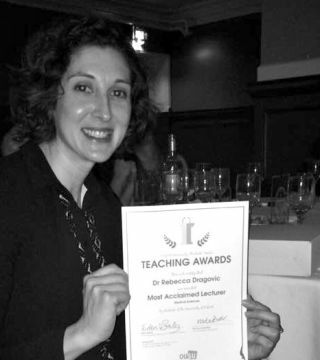 Congratulations to Dr Bec Dragovic, Postdoctoral Teaching Fellow for the department's MSc in Clinical Embryology - she has won the Most Acclaimed Lecturer (Medical Sciences category) at the 2017 Oxford University Students Union Teaching Awards. The award is real sign of appreciation from Oxford University’s student body and recognises her enormous talent and hard work. University Students Union (OUSU) invites students to nominate candidates in a variety of categories for the Teaching Awards. This year a record breaking 895 nominations were received for six categories. 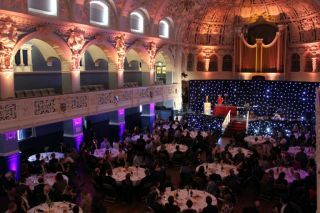 OUSU officers and student panels narrow this down to a shortlist before selecting the winners, who were then presented with their awards at a ceremony at Oxford Town Hall on 11th May.